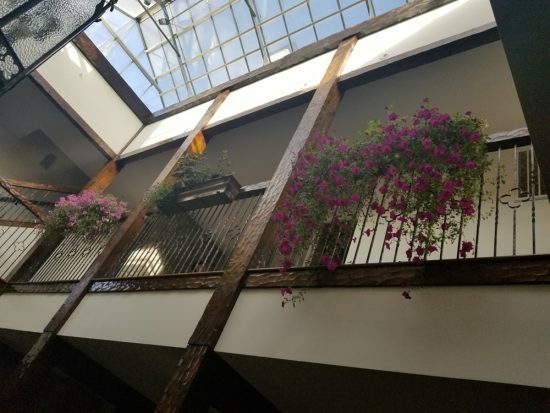 I have a pretty neat house, and one of my favorite features is a giant skylight over a stairwell. 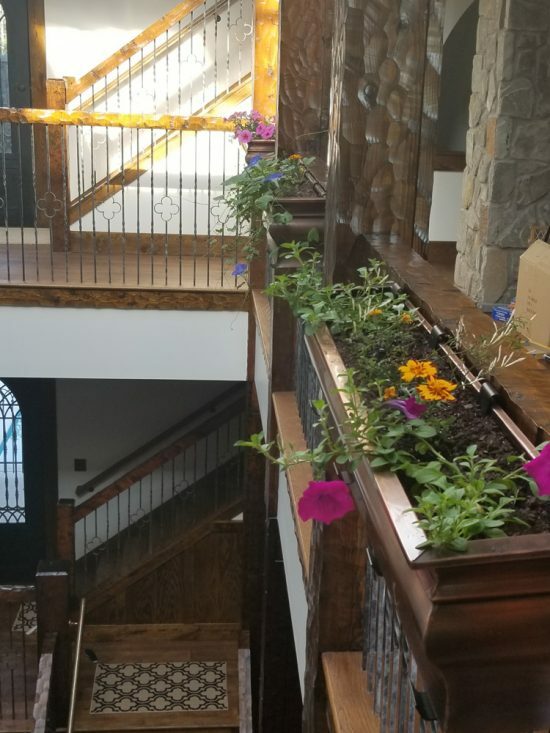 I’ve wanted to grow flowers in window boxes around those stairs, and it gets essentially full sun despite being indoors, however there are a couple caveats in that I have to use window boxes with no drainage (because it would drain on to my steps below). I previously blogged about my indoor gardening when I posted about growing Morning Glory indoors… that experiment ultimately did not work out like I had hoped. The morning glories grew but they were not as vigorous or floriferous as I would have liked, then they started to decline. I also have tried jasmine, which didn’t really flourish in my window boxes with no drainage, and I’ve tried begonias, which are doing well but drop too much plant litter for my taste. Because I am growing these things in window boxes indoors over living space I had to close all the drainage holes in the boxes. There are other ways I could have handled this such as by using an insert and backfilling with rock so the insert drained into the window box (which I would have still closed up). But doing so would have significantly reduced the amount of soil for the roots of the plants and I ended up deciding on giving the plants more space for their roots rather than drainage. I do not think my watering regime is keeping it too swampy in the bottom of the containers but perhaps the morning glory simply did not like it. So I’ve switched. I planted jasmine in two of the containers, along with petunias. The jasmine was doing fine though there was some initial transplant discomfort, then it got glossy green, now it has declined, it just wasn’t a happy plant. The petunias though, they have taken off, they’re doing really well. I bought “wave petunias” and they’re cascading down into the stairwell with dozens and dozens of blossoms. I give each window box about a quart of water a day and that seems sufficient to keep things in good health. This is the look I was hoping I would get with the morning glories, but live and learn. It is now almost February and they are still going strong. They need a little pruning (which is going to make a mess) and they’re blooming less with the shorter days I surmise, but they seem very healthy. I’m sure by now they’re fairly rootbound but must not mind. 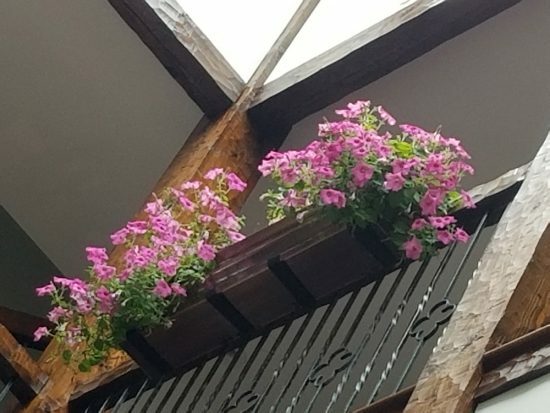 I think I will be able to keep petunias growing in these window boxes quite long term. The pink ones I really like, they were labeled a Wave Petunia and bought at Home Depot. The purple ones were also labeled a Wave Petunia and bought at Ace, they got more leggy, longer trailing, which can seem attractive, but also less densely flowered. One of my main goals was to perfume the house with the scent of flowers but none of these petunias are very fragrant. 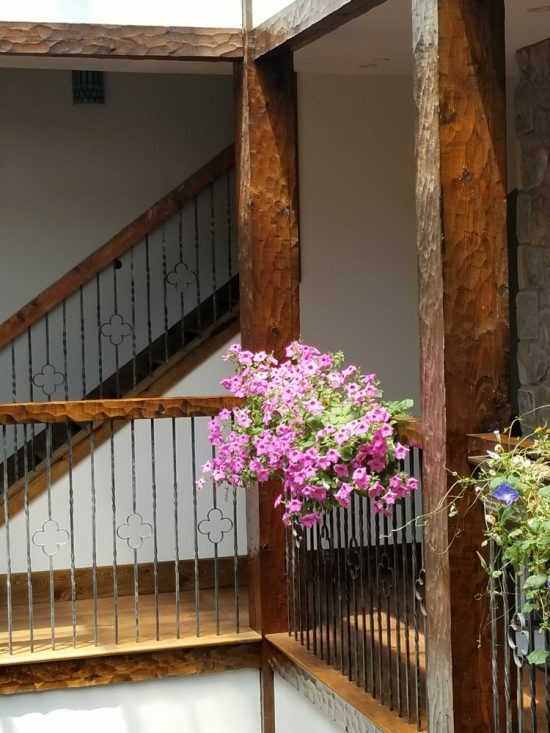 I have some new Scentsation petunia seeds on order that I plan to use and I will probably swap out the purple petunias and the middle planter where I had experimented with begonias for these new fragrant ones. consider pitcher plants. They hang pitchers, like moist soil, and eat insects. (had to put a couple apple slices out for the fruit flies).